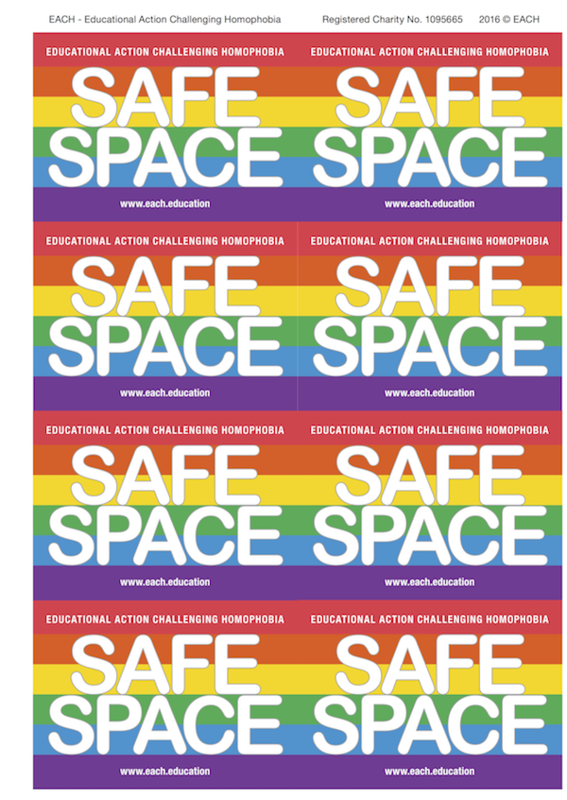 Safe Space Stickers set includes 16 stickers per set, supplied on two A4-size sheets with 8 stickers per sheet. Use as many sets as you need in your school, group, youth club or other young people’s setting. Demonstrate to a young person that you’re available and open to talk about LGBT+ issues as a ‘safe’ starting point in your school, college or youth setting. These stickers work 24/7 signposting your young people (or an adult on their behalf) to EACH’s Freephone Helpline via our website. EACH’s Safe Space Stickers as a set start from £3.99 (including P+P) and comprise sixteen stickers supplied on two A4-size sheets. Eight stickers per sheet. These stickers are proving phenomenally popular: welcomed both by young people and adults who have a duty of care towards them.